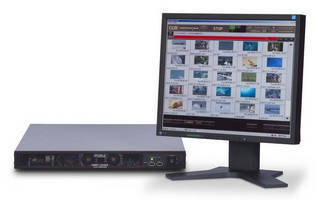 MXF Video Clip Servers create stable ingest/playout environment. Suited for file-based production workflows in ingest, playback, and playout applications, MBP-120SX and MBP-125SX are 1 RU servers that can capture files from external XDCAM drive or network drive, convert HD/SD-SDI signals to MXF files in real-time, and support up toÂ 8 channels of embedded audio. Additionally,Â MBP-125SX supports 8-channel AES audio. Both models are equipped with HD/SD-SDI I/O and 240 or 480 GB SSD and supportÂ diverse file formats. Cypress, CA - FOR-A Corporation of America, a leading manufacturer of video and audio systems for the broadcast and professional video industries, today announced two new compact MXF clip servers, the MBP-120SX and MBP-125SX, for ingest, playback, and playout applications. Ideal for file-based production workflows, the new 1 RU servers are being demonstrated at the 2013 NAB Show (C5116), which runs April 8-11 at the Las Vegas Convention Center. For ingest, the MBPs can capture files from an external XDCAM drive or network drive, convert HD/SD-SDI signals to MXF files in real time, and support up to eight channels of embedded audio (the MBP-125SX also supports for eight-channel AES audio). Both models are equipped with HD/SD-SDI I/O and solid-state drive (240 or 480 GB), and both are compatible with Sony XDCAM, XDCAM HD, XDCAM HD422, MPEG HD422, MPEG HD, and MPEG IMX file formats. Multiple MBPs can also be components of a user-constructed playout system that does not require a dedicated playout server. Material can be stored on a shared NAS unit, then specified MXF files can be transferred over the network to multiple MBPs. Output from the MBPs follows the automatic program playout system. MBPs can also be combined with another video server for more advanced configurations. Clips can be added over the network, even during video recording or playback, for seamless operation. In conjunction with FOR-A’s MediaConcierge media management system, an MBP can be incorporated into a user-constructed clip server application, providing database-driven management of video clips and playout programs. Each MBP ships with control software for standalone operation, and registered clips are instantly recognizable by thumbnail display in the control software. Optional software offers remote control of the system over the network and manages list-based clip playout. The MBP-120SX features one HD/SD-SDI input and output, while the MBP-125SX has four outputs, two of which support time code display. In addition to the MBP-120SX’s support for SMPTE RP188 ANC time code, the MBP-125SX also adds support for ANC and LTC time code. A full range of interfaces on both models includes an 100Base-TX/1000Base-T Ethernet port for high-speed file transfer, USB ports for connecting an external XDCAM or keyboard and mouse, RS-422 for external control, GPI for remote control of playback, and a DVI-I computer display port for use of the included control software. The MBP-120SX and MBP-125SX will be available in June. FOR-A is a major manufacturer and distributor of video and audio systems to the broadcast, postproduction and professional video markets. For more information about FOR-A’s product line, call 201-944-1120 or visit our web site at www.for-a.com. *Please note I am now using my cell phone line and Skype only for phone service.